In a previous post entitled Who’s afraid of the big, bad boss?, I touched a little bit on the Everything DiSC﻿﻿﻿﻿﻿ 363® for Leaders Profile as a great way to prevent bad management from plaguing your organization. Since then, I’ve received quite a few questions about the profile, and I thought a quick blog post was a great place to provide you with answers. What are the benefits of using a 360 report? Many of our clients use 360 reports to provide feedback on their leaders from all different angles. Your leader’s staff, supervisors, co-workers and even clients can all assess the leader’s skills, thus providing 360 degrees of personalized feedback. This type of feedback is vital for any leader to better understand their leadership style and make improvements. Like I had mentioned in that Bad Management blog post, bad management is preventable. Providing a leader with constructive feedback from the people they work with allows them to see how they are received by other people. What makes 363 for Leaders different? Many of the 360 reports out there are costly, time consuming and extremely complicated to interpret. Some 360’s are so in depth that you need to be certified to use them. Often the feedback is so detailed, that your leader can’t figure out what to do with the information. What’s exciting about the Everything DiSC 363 for Leaders profile is that the leader gets great feedback without the costs or the complication of other 360 surveys. Plus, you don’t need to be certified to administer it. Everything DiSC 363 is a DiSC-based report that uses narrative and graphics to give the leader the information they need to improve. Why is it called 363 for Leaders if it’s a 360 survey? The Everything DiSC 363 for Leaders gets its name because of its unique take on a traditional 360 report. Not only do leaders receive detailed feedback from raters, but they also receive “Three Strategies for Development” personalized just for them. The result is a clear roadmap for success specifically designed for your leader. Thus, the 363 gets its name. Yes. Similar to other DiSC Profiles, DiSC 363 has been research-validated by a team of experts. It was tested and developed for more than 3 years, and field tested with over 400 leaders and 3,000 raters. You can read more about the research by viewing our Everything DiSC 363 for Leaders Research Validation Report. First, you will identify who will be the leader. When you know who will be receiving the 360 profile, identify the raters. These can be co-workers, supervisors, employees, personal friends, neighbors, etc. The leader and raters will all complete the assessment based on their views. The 363 for Leaders Report will be generated and include every raters’ results compared to their own. “CommentSmart” feedback system allows raters to choose from a pre-selected list of comments. This saves time and avoids unpleasant remarks. Unlimited, anonymous raters make it easy to include as many raters as you would like and allows them to feel comfortable responding. “Three Strategies for Development” help your leader actively improve their leadership skills. Complimentary 363 Coaching Supplement. Each assessment comes with a 5-page coaching supplement to help you review the leader’s results along with them. Comprehensive report includes personalized narrative, detailed feedback by type of rater, big picture feedback and valuable suggestions for improvement. 363 for Leaders reports can be branded with your company name, logo and contact information by using our EPIC Online Administrative Account. 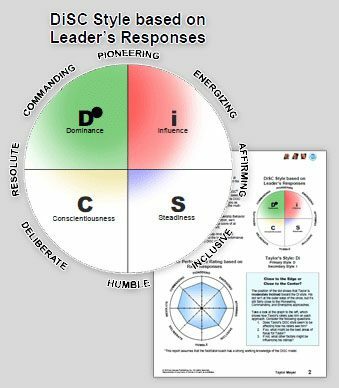 The Everything DiSC 363 for Leaders profile is a great way to bring DiSC into your leadership training. Although the report is extremely detailed, its narrative and visual components make it easy to understand and remember. Check out our Free Everything DiSC 363 for Leaders Sample Report and Coaching Supplement Report and see for yourself. Register today to attend our upcoming Everything DiSC 363 for Leaders online Product Showcase! Email me at jburns@corexcel.com for more information.